Event planning is one of those things that sounds much easier than it actually is. Corporate events involve many moving parts that only experienced event planners will take into consideration. An inexperienced event planner won’t consider all the variables during the planning stages. This inevitably leads to disaster on the day of the event, with all the guests shaking their heads at the pandemonium around them. Whether you hire a freelance individual event planner or you contract an event planning agency, hiring a professional takes a huge amount of work and stress off your hands. It may seem counterintuitive that you could actually save money by hiring an event planner, but this is often the case. An event planner is an expert at putting on a fabulous event within the parameters of a strict budget. An inexperienced event planner can easily run over budget. Between booking a venue, food and drink costs, equipment rental, staffing, and overseeing the whole affair, every detail costs money. With a professional event planner, you know upfront what the bill at the end will be. Part of a professional event planner’s uncanny ability to economize comes from their industry connections. Event planners have lists of venues, restaurants, staffing agencies, flower boutiques, DJs, bands, audio-visual companies, and more. Often, service providers partner with event planners and offer discounts for client referrals. This keeps a steady stream of business coming to the service vendors, and is a value-add that event planners can use to market themselves. Not only is it time-consuming to reach out to every service provider you’ll need for an event, it’s more expensive to book them. 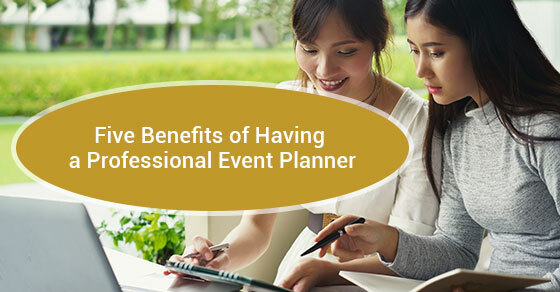 A professional event planner can essentially pay for themselves by passing along their preferred rates to you. Plus, event planners can vouch for the quality of partnered service providers. A venue they’ve recommended to a hundred previous clients, and that has come through every time, provides great peace of mind when planning your event. There are few better ways to source vendors than by word-of-mouth. Would you expect an event planner to know the proper scheduling timeframe for submitting a proposal? Obviously not. That’s because you’re an expert in your own industry and are familiar with standard procedures, and how to schedule around them. The same goes for event planners. Many a company party has been ruined by inadequate scheduling. For example, companies book popular venues far in advance for the holiday season, when most corporate parties take place. This can leave you with an inferior venue, or worse, out in the cold. Half the battle when planning a great event is knowing what steps to take and when. Event planners are well familiarized with proper scheduling procedure, and will ensure that your event is safely booked. Event planners have seen it all; they know what’s cliche, what’s traditional, and what’s experimental. Depending on your company’s culture and the type of event you’re hosting, an event planner can help you hit the nail on the head when it comes to creativity. Perhaps you could go with a themed party, or co-ordinate the venue decor to a specific colour scheme. Food, music, and presentation equipment can all be handled with creative flair. It pays to think outside the box for your corporate events: if your company claims to be doing so, doesn’t it make sense that your corporate events reflect this? One of the hallmark traits of any great event planner is their organization. As previously mentioned, there are many moving parts when it comes to event planning. It requires countless emails and phone exchanges with vendors, scheduling everyone’s coming and going, and making sure every detail is accounted for. The task could easily overwhelm a novice event planner. Hiring a professional event planner will save you time, money, energy, and stress, all while ensuring your event goes off without a hitch. Event planners are social and creative individuals, and will imbue your event with those same qualities. Event planners are also highly skilled at distilling the goals of their clients into actionable tasks, so that your event perfectly portrays your company’s essence. At Chateau Le Jardin, the multi-purpose venue provides over 30,000 square feet of function space for your use. This space includes majestic fireplaces, a gorgeous foyer with 30 feet ceilings, and a beautiful courtyard space. The ballrooms embrace natural lighting and include built in backdrops. With its expert catering and culinary team, accessible location, and complimentary ground level parking, Chateau Le Jardin is the perfect venue for your next event. Hiring a professional event planner for your next corporate function is a great move and will result in an event that runs smoothly and accomplishes your goals. For more information about Toronto’s premier event venue, contact Le Jardin at (289) 236-2572 today or visit us on-site at 8440 Hwy 27 in Woodbridge, ON.